currently I'm working on a marble dispenser , which is continously filled up with marbles and then releases them to five slots. 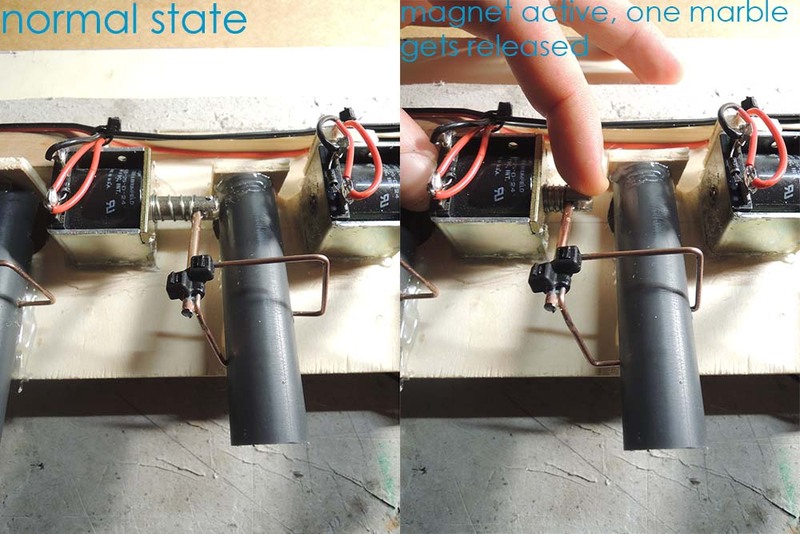 The release mechanism is done with electromagnetic solenoids and a metall wire to make sure only one marble gets released. The huge problem I have now is, that on the entrance slots of the 5 outlets the marbles always get stuck. Actually I'm pretty desperated, because its the second dispenser I built (the first one worked even worse) and now it's still not working properly. I already tried to guide the marbles by using these welding rods, but the problem remains. Any ideas how to avoid this? Did anyone of you build something similar? 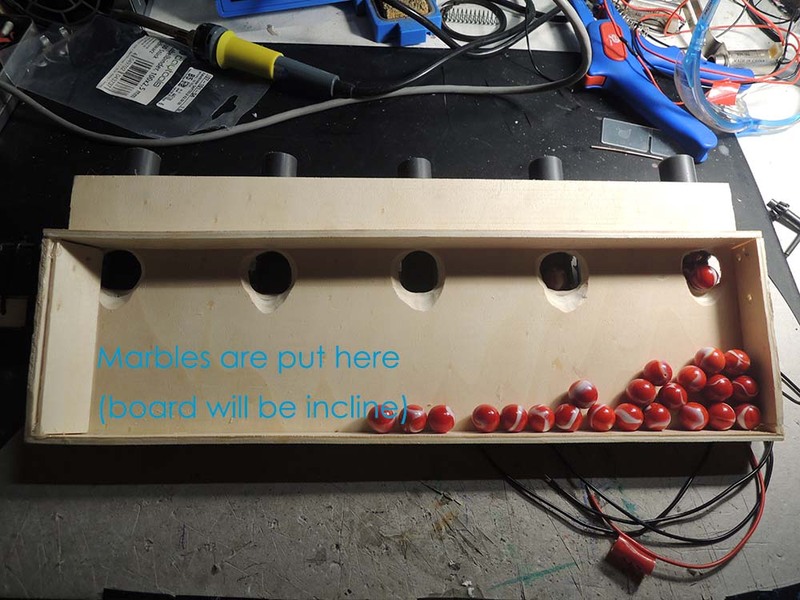 One idea to move stuck marbles is to put another solenoid which "knocks" on the board every now and then, but this would be the absolutely last solution since it is very loud. 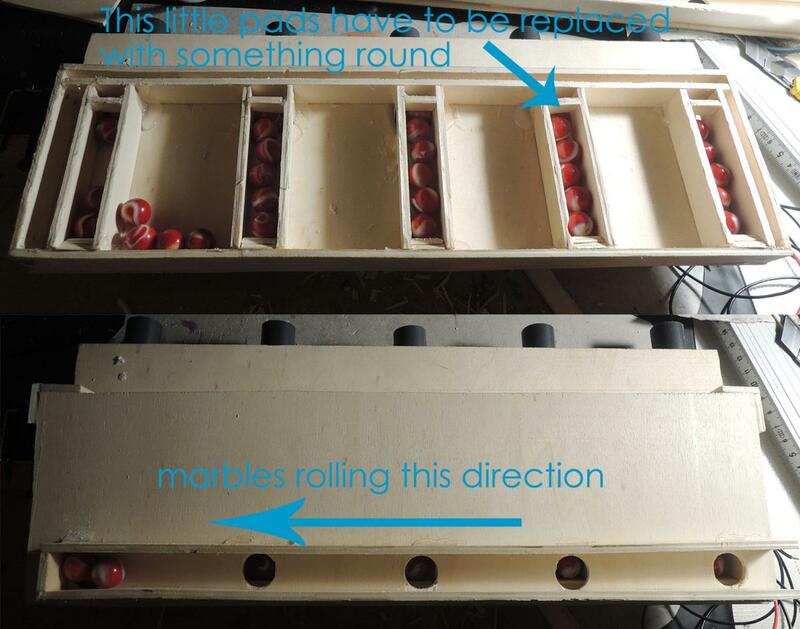 * the general question is somehting like "How can I guide marbles rolling down a skew platform into multiple "slots" without the marbles blocking themself"
I'm going to move this from the help forum to the marble run forum. The marble run makers might have some ideas for you. I'll also post a link in the main chat forum to see if anyone there wants to poke their head in and look at your challenge. welcome also. First to your idea of using the solenoids for dispensing. The idea is great and simple. The problem on the inlets is immanent to all funnels and alikes but I am a little bit surprised that the marbles falling vertically block the entrance. It seems that the pipe leading to the locking mechanism gives a marble drop of roughly one or so marble diameter? Does the blocking also occur when there is no pipe below the hole? From experience I know that at every place where marbles coming in parallel on a wide surface getting forced into a single lane there is such blocking. Depending on the result of the "without the pipes" experiment I would suggest to reconstruct the inlet section. Just drill a hole in the board, its diameter shall be not more than the pipe or hose inner diameter, a little bit less is of no problem. Have a thick hose or a pipe with not more than 1+ 1/4 marble diameter go down nearly vertically (really steep!) and then lead it over to the dispenser in a narrow or wider bend. Do not assemble the pipe as a sharp corner because there in the corner might be blocking action again. Some of this large clear plastic hoses will get smoother for bending when heated with a hot air gun or in boiling water (attention to your hands). If you do not succeed, it might be an idea to have a rope/string driven by a motor push some marbles back or aside. This might be a more silent way than a hammer. But I think that this is not necessary. Feel free to share your experiences with us. One other simple idea is to mount a wall from left to right so that it crosses the hole's centers. This wall has a half drill at each hole, of course, to allow one marble to pass into each hole. Maybe you can try this with a piece of cardboard cut in shape on one hole first. But there is no guarantee that there will be no blocking with this. The geometry is crucial anyway. Interesting project, and welcome to the board! Or the 'release' wire shutting the tube too quickly before gravity allows the next one to take it's place. That's a bit more complicated and could require another piece of wire and zip tie, off the solenoid. If I were doing something like this, a V-shaped trough full of marbles above an auger that spans the five slots, and each 'revolution' on the auger would move a marble horizontally from a 'safe' position (not over a hole), to a released position (over a hole). I have sometimes the same problem in my marble runs (2 or more marbles that blocks a hole or path), it's quite difficult to solve it. 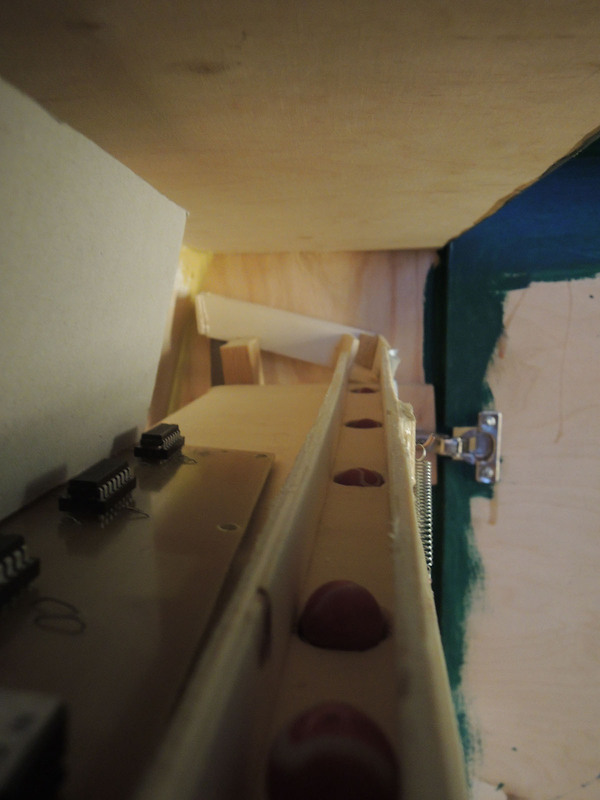 In my marble runs, i make wide paths (wide enough to fit 2 or more marbles in with) to lower the chance of jamming. Where is it intended for? Yes I also though using a vertical drop would solve the problem. I tried your idea with the centre wall but it didn't improve the situation. Yes, using an active mechanism, like with an auger, or a moving slot-sheet would be the best solution I guess. The dispenser will be part of an electro-mechanical acarde-machine. I will post some information when its finished. I think the hard thing about mechanics is that finding a solution by trial and error causes a lot of handicraft. In electronics or programming you can change things and find a reference design or do copy and paste more easily. Does someone of you know a book with generals ideas/concepts in mechanical construction? I just found the clip where a possible solution is shown. It is just a few seconds after the very beginning. Even those guys are using ping-pong-balls they encounter the same problem - and look to their solution: https://www.youtube.com/watch?v=tLhLM1bLIoQ It needs some additional mecahnics, that is the drawback. In general another solution to the problem "wide inlet to single lane out" could be a construction like the roof rail (hope this is the right name for the half pipe collecting all the rain from the roof and guiding the water to its end into the down ward pipe). Take a tilted area and mount such a half pipe shape to its lower edge. The half pipe itself is tilted slightly towards one end. This way it should be possible to get the marbles arriving in parallel lined up to the outlet. The half pipes diameter should be less than twice a marble diameter, from scratch I would try something around 1.5 marble diameters. To avoid a blocking of the downward pipe the half pipe should extend over the edge of the surface. 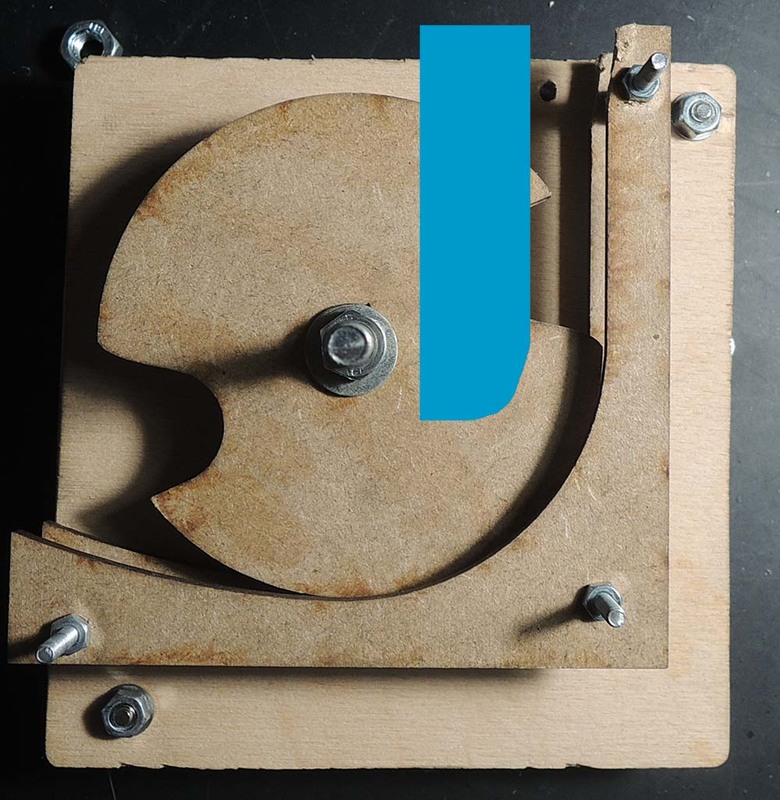 Or you can use a triangular shaped guidance to get the marbles away from the hole. Or you can guide the half pipe end into a hose. This idea could be extended to more outlets. Each outlet receives such a roof rail collecting marbles from a segment of your skew platform. The basic trick is to have the marbles fall down a little bit over the edge and then line up themselves into a single row leading away transverse to the arriving direction. If you find prototypes made from wood not sufficient for some reason, you might try some ideas first with some paper and glue. 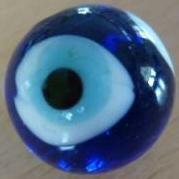 Best way to find out how marbles behave is to observe them in the construction. Trial and error is also my approach when I am not able to calculate things. Sometimes I create an obstacle just with one of my fingers or putting a heavy weigth into the track. Then I observe what changes and in what way. But even if this looks fine for some minutes there is no guarantee that the issue will not show up once a hundred working hours. To be more flexible I use a construction toy for experimenting. A last hint came into my mind: Symmetry is nice for looking at. Symmetry is a cause for stable configurations of blocking marbles. Asymmetrical construction sometimes cures the problem. Unfortunately I have no idea of an actually available book with a collection of mechanics like in the video. Mine is from 1925 and out of print long ago (and a german print on top of that). Going back to the first picture, in the first post, on the platform is there any reason you couldn't have a trough (connecting the holes) or multiple troughs (leading up to each hole) instead of just a hole? now i put everything together for testing. On the first picture you can see the marbles coming up through the pipe at the bottom of the picture. This is connected to a marble pump, which is working fine at the moment. The only problem now is that inclination is too small. So marbles don't run to the end of the line. So after some time the slots at the end will definitely remain empty. Either I now add some extra motion to this now, with a small vibration motor or some solenoid, or I have to increase inclination, which is difficult here, because the "highscore display" is already there. While working out the whole concept I had no idea that this part would cause so much trouble, otherwise I would have thought of something more efficient. Proper CAD construction would possibly eliminated some of the problems, but that's no way if you do it the first time and for a single piece. I don't get what you mean by "trough"? yes, in the video they had the same problem and I guess to have a reliable system a motor or something else is needed. A roof-rail-like construction seems to be a good idea, too! from the two pictures I think you have just figured out a valid solution. It seems that there is enough height difference from the pump outlet to the slots of the dispenser(s). If the inclination of the trough (the small well with the holes for the marbles in its bottom) is too low it might be an idea to use a round shape in the corner to change the direction of the marbles. A bare corner will eat the energy of the one direction. A round shape of the wall will conserve most of this energy to the new direction. Try cardboard or a hose there. Or simply lift up this corner - less increase to the track form the pumps mouth, more inclination to the dispensers. I think that to avoid further underruns of the dispensers need to have a certain sequence otherwise the first ones will block the last ones from getting marble supply. You took that into account already? Anyway my latest thought on your trough with the holes in it seems not to be the best choice. The marbles residing in the slots give not a perfect way to the marbles that need to get to the far end dispensers. What about a dedicated lane for the marbles leading to the far end dispenser. All the dispensers closer to the pump receive a flap that opens to reload the dispenser, or closes to guide the marble to the next section. You need one flap less than the count of dispensers and some precise control where to guide the marbles to and thus this complicates your mechanism. Maybe the flaps can be operated by the marbles that are already in the dispenser just by their weight? I think with such a setup you do not need to change the inclination. 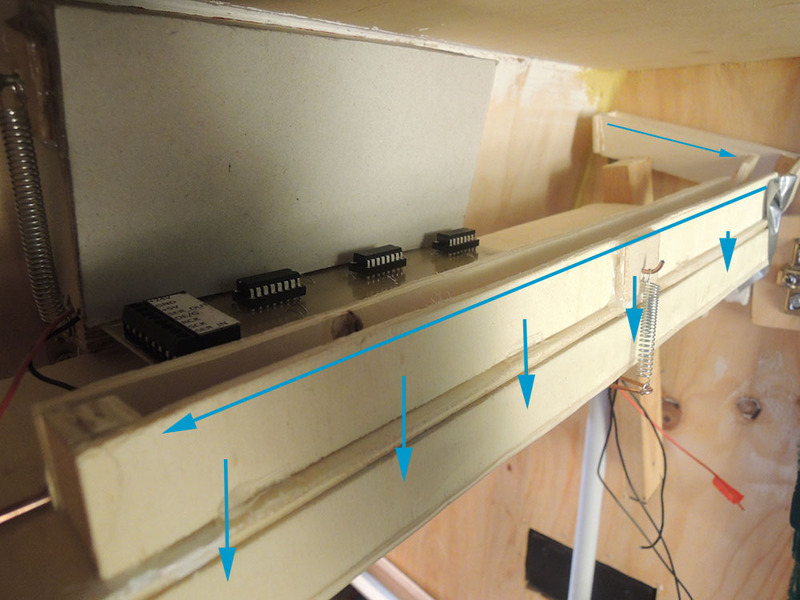 The idea is to have the marbles run there where the electronics board is residing (maybe below it) and the flaps then give way to the already existing holes. The "marble pump" you use - is it working according to this priciple? building a second runway and extra flaps sounds good, but i think it would lead to new problems and makes it more complicated. if everything is roughly working I will smooth the edges and try to fix everything more properly than it is now. 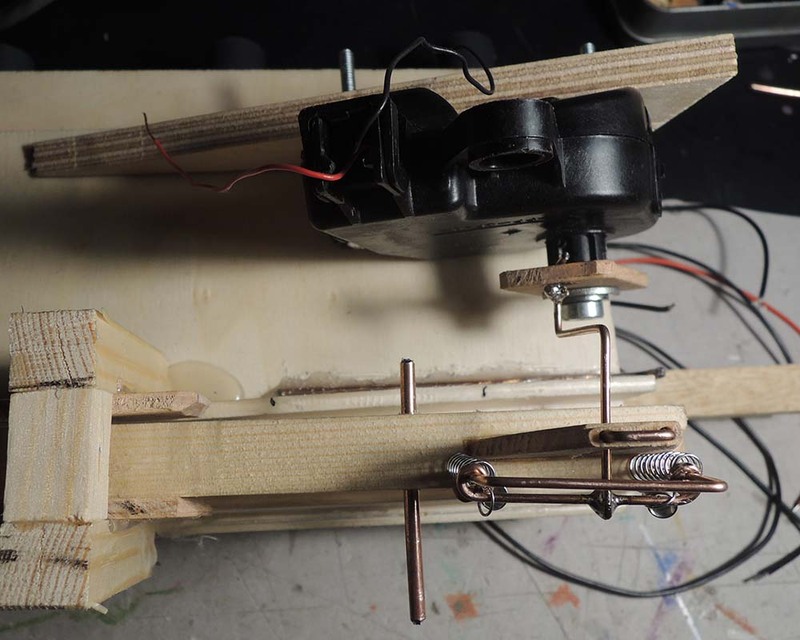 Now I found an old motor from a cars' door and built a mechanism to push the marbles towards the last slot. but the rubber will improve it I hope. I'm still sceptical if it will work with the whole setup, because the motor is quite slow but I liked the idea and wanted to try it. thanks for link to video and sharing your pics. The marble pusher looks very interesting. I hope that the mechanism will not jam when marbles queue while not getting dispensed. The marble pump is quite simple and the geared motor looks as if it provides the necessary torque. One very fine property of this device is its small size.